What is the difference between Futsal and Soccer? 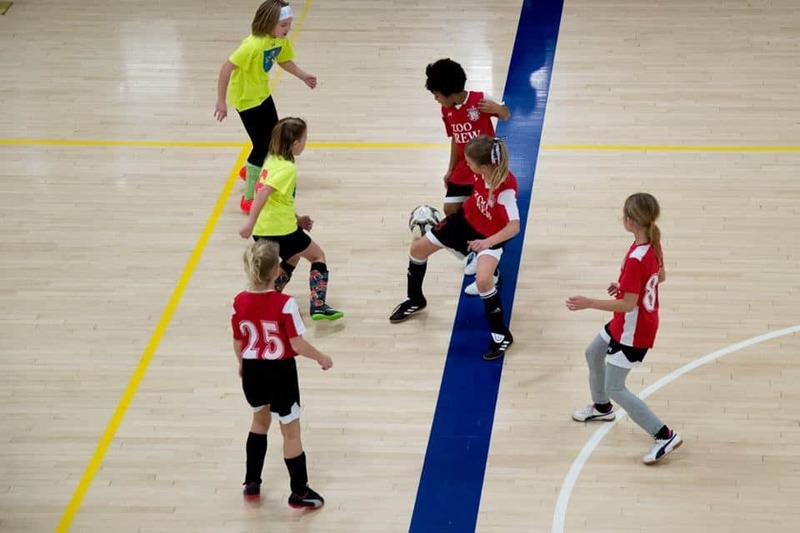 What is best to play in the winter, soccer or Futsal? Which sport should my child play as a youth, Futsal or Soccer? Futsal is still fairly new to many around the globe, however Futsal has been played since it originated in Uruguay in the 1930s. Lets take a look at the differences between futsal vs soccer because I get this question so much.. We can also review the other questions we get about Futsal as mentioned above. If I missed some that you think about, please write them below on the comments and I can keep adding to this article. 1. The Futsal ball, it’s a different size, weight, and bounce. I think everyone knows this already. But you should probably know that the senior size futsal ball is actually LIGHTER than the size 5 soccer ball. Did you know that. I had a parent ask me one time if their child should play goalie because the Futsal ball was “heavier” and could hurt their child. 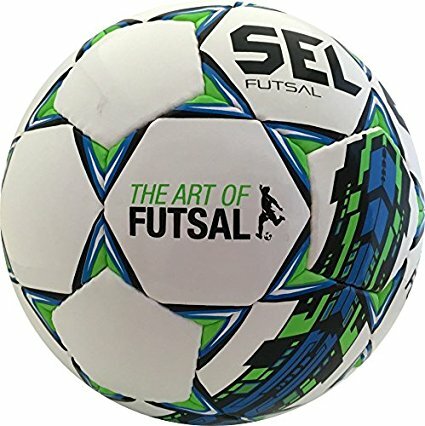 I did some research and found that the futsal ball is actually lighter, go figure. Everyone always assumes that the futsal ball is heavier. 2. What are the numbers in Futsal vs Soccer. 11 v 11 Soccer and 5 v 5 in futsal. Futsal is sometimes referred to as 5-a-side. One goalie and 4 “field” players. Soccer has 1 goalie, 10 field players. halfway-line or (2) been touched by an opponent. 3.5 The official size for a Futsal goal is 2 X 3 METERS or 6.5 ft X 9.8 ft . Some say it's too small, but the futsal goal is a ton of work for goalies since play is constantly in attack. It's important to have the correct size futsal goal so that kids learn to play the correct techniques in futsal. Let's review the Quick Play Futsal Goal. 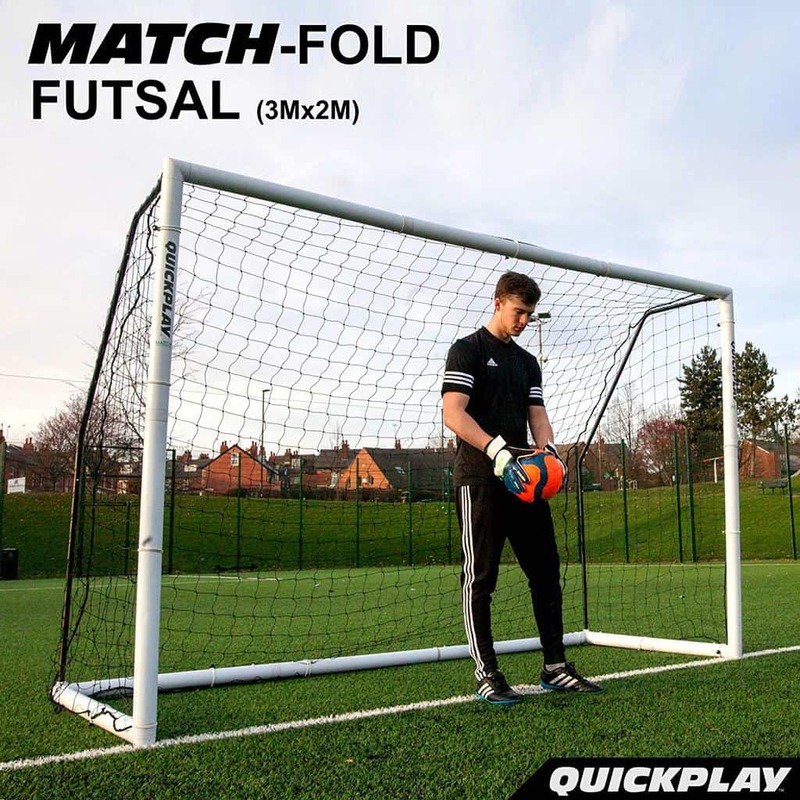 ★ OFFICIAL FUTSAL SIZE (3Mx2M) ★ The premium level coaching goal, ideal for backyards or shared use coaching fields at schools, colleges and soccer camps. STRONG 3 inch diameter uPVC Crossbar & Posts – Thicker and more durable than cheaper PVC goals on Amazon and significantly lighter than steel frame goals. THE ONLY GOAL that can be FOLDED FLAT for storage or PACKED AWAY IN A BAG – All Match Fold goals are fully portable, with CARRY BAG INCLUDED as standard for transport to the pitch. QUICKPLAY's unique pre-attached pole system allows fast and easy set-up in around 5 minutes. In addition, Match-Fold goals also fold flat for easy storage against a wall or fence, taking up minimal space, while being super quick to set up again. From folded setup only takes 30 seconds. QUALITY & DURABILITY – Strong enough for all ages this Match Standard Goal features a heavy duty net and includes QUICKPLAY's unique shock absorbing bungee attachment system for longer net life. Designed in the UK by soccer players, for soccer players and used by professional soccer clubs, schools and colleges around the world. 2 YEAR PARTS WARRANTY – When buying ‘New’ direct from QUICKPLAY (seller) you will receive our 2yr parts warranty, from a company that prides itself on customer service. We recommend you only buy from QUICKPLAY - Sales from unauthorized resellers or ‘Used’ products are not covered by 2yr warranty. 4. Substitutions in Futsal vs Soccer. Soccer has a limit of 3 substitutions, Futsal has unlimited substitutions, but with a roster limit of 12 futsal players. Although unlimited substitutes is the case in most outdoor soccer leagues throughout the US, FIFA only allows 3 subs for one game. In Futsal, the substitutes are unlimited from youth to FIFA. 5. Throw-ins in Futsal vs Soccer. There are no throw-ins in futsal, you must play the ball back in with your feet once it goes out of bounce. If the ball is played out the end line, the goal “throw” is awarded in Futsal, not a goal kick. 6. Goal Throws in Futsal vs Soccer. There are no “goal kicks” in futsal, however there are “goal clearances” in futsal. The goalie must throw the ball in or drop kick the futsal ball, however the goalie cannot come out of the goalie box with the ball. In soccer the goalie can punt the ball, throw it, or dribble out of the box with the ball. Once a goal kick is awarded in soccer, the goalie can only kick the ball out of the box. 7. Game Clock in Futsal vs Soccer. In Futsal, the clock can be stopped during an injury or for other delays. In soccer, the clock does not stop, it’s a “running clock”, but time could be added at the end of the game. In futsal there is no “stoppage time”. Futsal has a 22 Minute half, while Soccer has 45 minute halves. 8. Timeouts in Futsal vs Soccer. Each team gets one timeout per half in Futsal, but in soccer, there are no timeouts. 9. No shoulder charges allowed in Futsal vs Soccer. Futsal is a game of skill and less about strength and power. Although slide tackles were recently allowed into the Futsal leagues by FIFA, shoulder charges are still discouraged. Obviously in soccer there are slide tackles and shoulder charges. 10. 4 Second Restart Rule in Futsal vs Soccer. There is no actual restart rule in soccer, but in Futsal, you MUST restart within 4 seconds of ball going out of bounds or on a goal throw or risk losing the ball to the other team. This helps with the speed of the game. 11. No Offside rule in Futsal vs Soccer. While soccer has the offside rule to discourage cherry picking, Futsal does not enforce the off side rule due to the small size of the court, I don’t know this for a fact, but I will assume that it’s true. The futsal court is limited in size. 12. Sent off player can be replaced in Futsal vs Soccer. In Futsal, when a player receives a red card, that futsal player sent off can be substituted for after 2 minutes or after the other team has scored. This the complete opposite in Soccer as the player sent off cannot be substituted and the team must play a man down for the rest of the game. 13. Positions if Futsal vs Soccer. Futsal has the Fixo, Pivot, and Ala (2). Soccer teams have the Defenders (4),Midfielders (4-5), Forwards (1, 2, or 3 depending on formations. What Soccer ball for my 5 year old? Some recommended products may use affiliate links. SoccerShopForYou.com is a participant in the Amazon Services LLC Associates Program, an affiliate advertising program designed to provide a means for sites to earn advertising fees by advertising and linking to Amazon.com. Amazon and the Amazon logo are trademarks of Amazon.com, Inc or its affiliates. Copyright © 2019 Soccer Shop For You. All Rights Reserved.